In just a few hours I will be hopping on a plane to a beautiful island. Unfortunately, the weather forecast says that I should expect warm rain for the entire trip. This has made packing somewhat of a challenge so I thought I would share my list with you. A brief overview of everything in my backpack(s). I was tempted to skip out on bringing a day bag this trip but I decided it was more comfortable to have two, half-full bags than one bag that was stuffed to the point of it being a pain to get in and out of. I will run over everything I’m taking and then break down what went in each bag at the end. Basically everything except for the Electronics category went in my backpack (you can check out the details of the bag here). 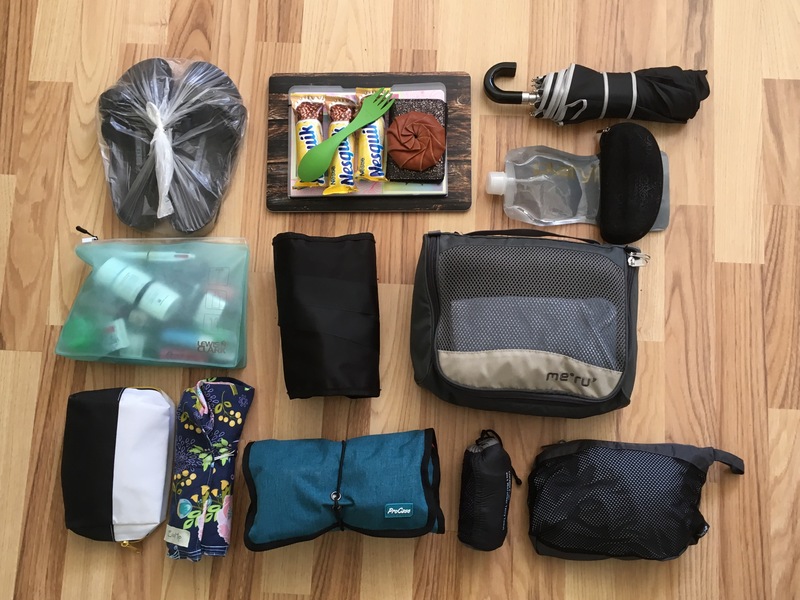 All of my electronics, snacks, and wallet went in my day pack for easy access. Both bag combined weighed in at around 7.5 kg (16.5 lbs). My max is 10 kg so I’m well under for both size and space. That’s it! I would not claim this to be a minimal packing list at all but I do think it’s pretty reasonable for a week. I will talk to you all next week when I can share my adventures in Portugal!